13 Gambit cards that give players special abilities they can unleash during the game! 3 Merc Cruiser Ship cards that can act as an ally for any faction. 2 Solo Challenge cards allowing for solitaire play. The addition of the Gambits are a real game changer. And I mean a real reversal in fortune can happen for you if you turn over the right one at the right time. With ones that lower damage taken to you by 1 and ones that give you 1 more attack point each turn. There is even a card that gives you 8 “health” and lets you draw a card. You can even get the card that does 8 damage out of nowhere. Huge swings can happen. Add to that there is Co-Op and Solo Bosses. Plus 3 copies a wild card ship that you can just choose it’s alliance icon. Great little expansion at a great little expansion price. 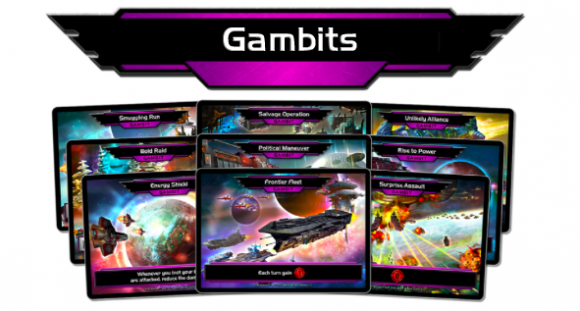 Add a Review for "Star Realms: Gambit"